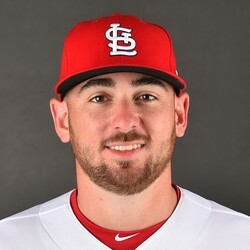 Austin Gomber allowed five earned runs in 2.1 innings in the Cardinals' 9-1 spring loss to the Mets on Sunday. He allowed six hits and two walks while striking out one. Gomber also served up a pair of homers in this one, with a three-run shot by Amed Rosario doing the bulk of the damage against him. Gomber is in the running for a rotation spot in St. Louis, but has had an atrocious spring. He's allowed eight earned runs in seven innings thus far, along with five home runs. From a fantasy perspective, Gomber is probably the least interesting of the pitchers in the mix for that final rotation spot, as Alex Reyes, Dakota Hudson, and Carlos Martinez are all vying for it as well. Gomber would be an NL-only league option only if named a starter.